5 Bedroom Detached House For Sale in Tavistock for Guide Price £650,000. 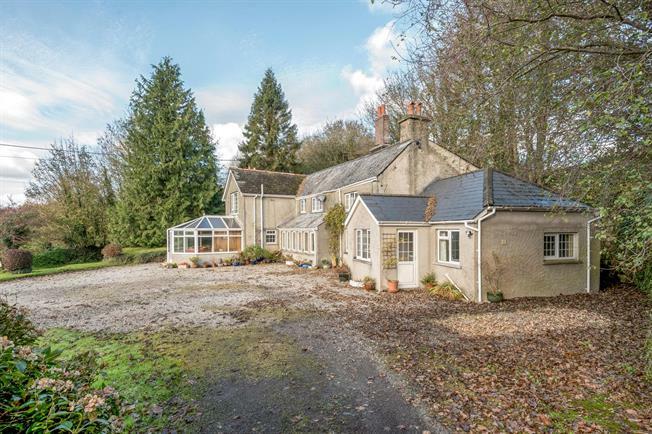 A delightful five bedroom country house with an attached annexe set within gardens and ground extending to approx. 12 acres situated on the fringes of the quaint village of Milton Abbot. This property is an extensive country house set in gardens and grounds of approximately 12 acres. Located on the fringes of the quaint village of Milton Abbott this 5 bedroom property has an abundance of accommodation that is flexible within it's layout to allow for large families, guest accommodation or letting potential with the attached one bedroom annexe. The property is situated in at the very end of a quiet country lane, not overlooked by the neighbours but with the advantage of being close to neighbours, the village and good road access, without being impacted by any of them. The ground floor accommodation for the main house consists of a spacious kitchen which has a range of wall and floor mounted units, oil fired Rayburn (which heats the hot water) and is linked to the conservatory that is currently used as the dining room as it has fabulous countryside views. The formal sitting room is flooded with natural light from it's south facing aspect and has a large open fire which makes this sizable room warm and toasty in the winter. The rear of the property has an office or snug room and separate utility room which has an external door ideal for those day returning with muddy boots and wet clothing. Off the utility room is a shower room with WC. Rising to the first floor there are 5 bedrooms with the master bedroom having an adjacent room which has been used as a dressing room or equally as a nursery room and has built in wardrobes. Two separate bathrooms service the five bedrooms on this floor. The master bedroom has far reaching rural views and has built in wardrobes, as does one of the other double bedrooms. Attached to the main house is a single level one bedroom annexe which is ideal for a dependant relative or equally for letting purposes for additional income. The Annexe could benefit from some refurbishment and consists of a good size kitchen for this annexe, bedroom with southerly aspect, separate sitting room, shower room and a useful workshop/store room. Externally the property has copious parking for multiple vehicles including plenty of space for a caravan or motor home. Immediately in front of the house is one of the smaller paddocks the property owns which is gently sloping away down to the road which allows for delightful views of the rolling hills across the valley. There are three further well fenced fields and a charming wooded copse beside the property. In all this is a substantial property in a convenient and popular area. Milton Abbot is a pretty village situated about midway between Tavistock and Launceston, within the unspoiled, rolling farmland of West Devon, close to the River Tamar and Cornwall border. The village takes its name from having been part of the original endowment of Tavistock Abbey and possesses a fine 15th Century church. Many of the houses and cottages were built as a model village for the local workers by the Duke of Bedfords estate and designed in the Lutyens style. In the village there is also a pub, shop and primary school. The nearby ancient stannery town of Tavistock possesses a full selection of local facilities including shops and restaurants, and private education with Kelly College and Mount House Preparatory School. Just beyond Tavistock is the western boundary of Dartmoor National Park, renowned for its spectacular scenery and providing many opportunities locally for walking, riding and fishing. Nearby is the beautiful, partly wooded River Tamar Valley and to the south the estuaries of the Rivers Tamar and Tavy, and the beautiful South Devon and Cornwall coast with its beaches, estuaries and excellent opportunities for sailing. The following services are available Mains electricity, Private water supply, Private drainage, Oil central heating, Rayburn supplying hot water and telephone connection although we have not verified this. Council tax ban D.